WARSAW, Poland — A man with a knife stabbed people Friday at a shopping mall in southeastern Poland, killing one person and injuring nine others, police said, ruling out terror or political motives for the attack. 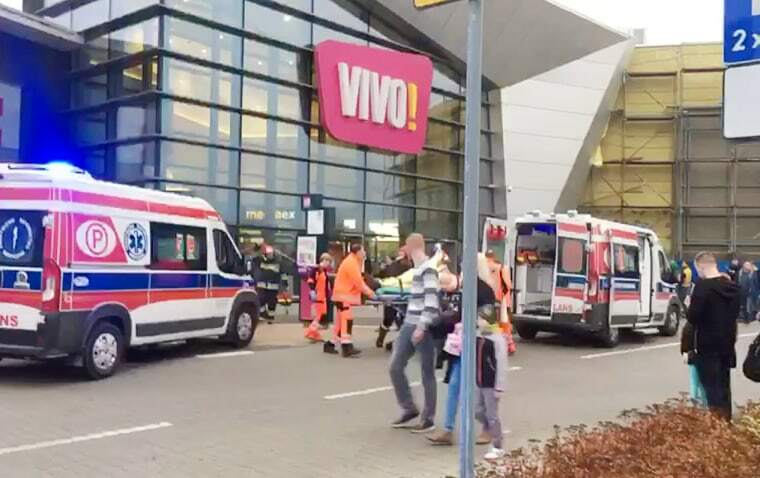 The alleged attacker, a 27-year-old local Polish man, stabbed people at the VIVO! mall Friday afternoon in the town of Stalowa Wola. He was detained by shoppers and handed over to police when they arrived, Anna Klee, the regional police spokeswoman in Rzeszow, told the PAP news agency. "He was attacking people from behind, hitting them with the knife," she told the PAP, adding that a 50-year-old woman who was attacked died later in the hospital. Eight people were taken to hospitals in Stalowa Wola, Tarnobrzeg and Sandomierz, most with serious wounds, including the woman who died, regional police chief Krzysztof Pobuta told reporters. One other person had lighter injuries and another was being treated for shock. "There's no terrorist or ideological context for the attack, it's rather his poor psychological condition," Pobuta said. Regional governor Ewa Leniart said four of the injured had undergone surgery and two of them were in critical condition. She said five women and four men between 50 and 18 had been stabbed. The man "acted irrationally, could not explain the motives for his actions," National Police spokesman Mariusz Ciarka said, adding that a breathalyzer test showed he was sober and blood tests were being done to check whether he was under the influence of any other substances. A search of the alleged attacker's home revealed medical documents saying he was a psychiatric patient, Ciarka said. Regional prosecutor Adam Cierpiatka said the detained man will be questioned Saturday and could face charges of murder and multiple counts of attempted murder. Prime Minister Beata Szydlo returned from a European Union summit in Brussels, calling the attack "very sad news" through a spokesman. She said the authorities will extend full assistance to the victims and their relatives.